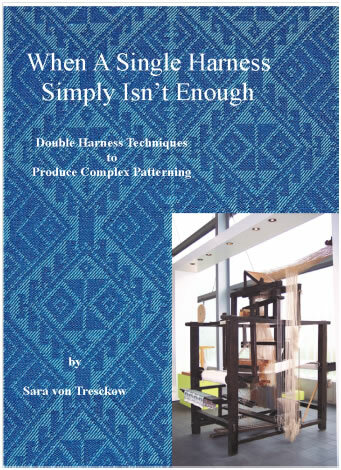 Drawloom Book - "When A Single Harness Simply Isn't Enough"
To order, use our INQUIRY/ORDER form or the BUY NOW button. Some minor errors have been discovered. Click here to link to the PDF errata file. If you find something to be incorrect, please let me know and it will be included in the errata file as soon as possible. "Sara has put an incredible amount of work into this book. It gently holds the hand of anyone new to weaving on a drawloom, but also includes plenty of meaty material for the advanced weaver. The book includes a nice history of double harness techniques and discusses the mechanics of a wide range of equipment available today. You will find detailed setup instructions for a multitude of variations. Several wonderful combinations of weave structures are included at the back of the book, as well as various special methods for the selvages, which will be of great interest to advanced weavers. 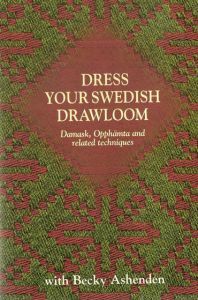 This book is a must-have for any drawloom weaver, along with theDress Your Swedish Drawloom video from Vävstuga Press."